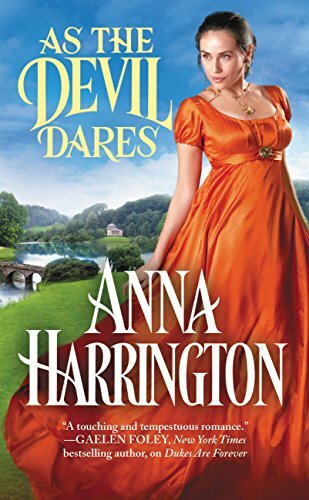 I have been a fan of Anna's books since I read Dukes are Forever (The Secret Life of Scoundrels Book 1). Three years ago and have followed all the characters, through there own books ever since. So when the opportunity arose that I was given the chance to review As The Devil Dares, I wasn't going to turn it down. Out of all the Carlisle books. This book I could relate too the most, because my mum passed away when I was young. In the book Mariah was a little girl, I wasn't that young I was in my late teens, but I do remember the guilt and anger that comes with the grief. But everyone deals with the loss of a loved one, in different ways. This is what happens to Robert, who is carrying the guilt of his father's death and is constantly trying to seek his approval, what Robert doesn't realise is that his father was proud of him when he was alive and was still proud of him when he died. So let me tell you about this wonderful book. Mariah desperately wants to run her father's shipping business, but her father has different plans for Mariah and her sister Evelyn, because when her mother was dying her father made a promise that Mariah would become a proper lady. Now for this to happen Mariah needs to have a season, well she has six of them and coming into her seventh and Evelyn has had five, but no offers have come forward for either of them. But because Mariah is such a strong and feisty woman, she and her sister have caused a lot of trouble, nothing serious just mischief, like driving a phaeton on St Jame's Street, so in society Mariah is called the hellion. But underneath Mariah has a warm and loving heart, who loved being at Gatewell School, because that is where she feels closest to her mother, but she also loves her father and sister. But she also feels that since her mother's death, there is a distance between her father and herself. Because when she was a little girl, she was always with her father in the shipping office, either playing on the floor, and when she was older her father gave her some jobs to do. So what can I say about Robert, well he is a lovable rake, which I've already said is carrying a lot of guilt. As with Mariah, Robert loves his family dearly and this shows when he climbs a tree for his niece Clara, to save her kitten Daisy. For me this book definitely pulled at the heart strings, I loved the humour and I cried along with Robert and Mariah. I will give this book 5/5 stars. This book is available to buy from Amazon on 6th March.